The Carnival at the End of the World Tarot is “an oracle for uncertain times.” It’s an art deck exhibiting the beautiful macabre, with a haunting melody and flow to the cards, that have just a tinge of an old horror film set with circus clowns and supernatural happenings. 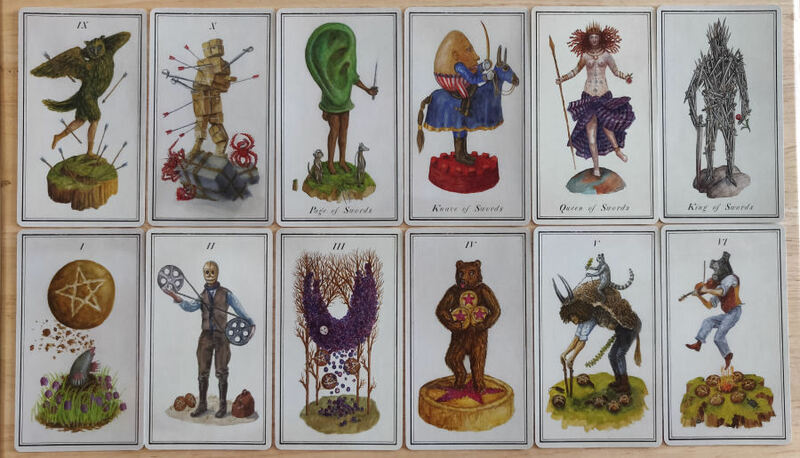 The deck is a tarot byproduct of an art collection by Nicolas Kahn and Richard Selesnick, who are based out of upstate New York, a region very close to my heart. The country of origin noted on the tuck box for the deck notes Taiwan, which again is close to my heart so already I’m adoring Carnival. 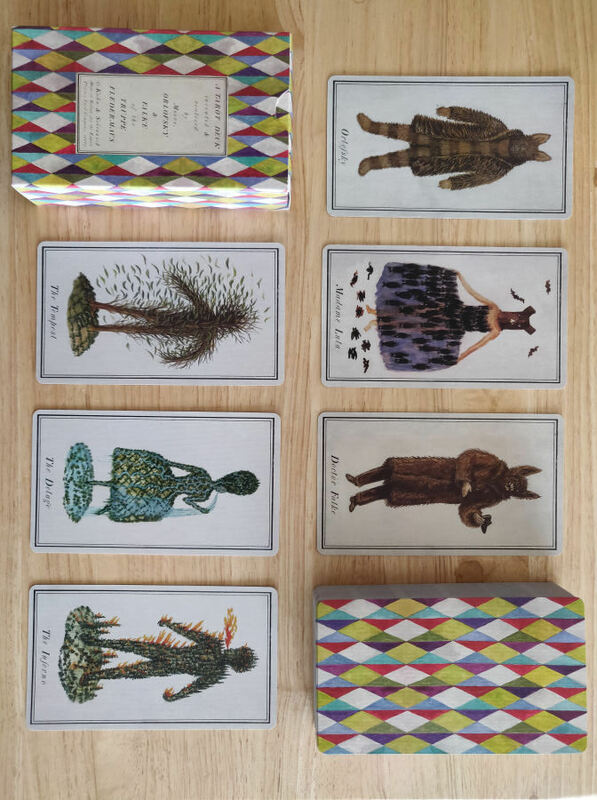 The above photo shows the extra card in the tarot deck. They’re based on the main characters in the Carnival at the End of the World: Doctor Falke, Count Orlofsky, and Madame Lulu. 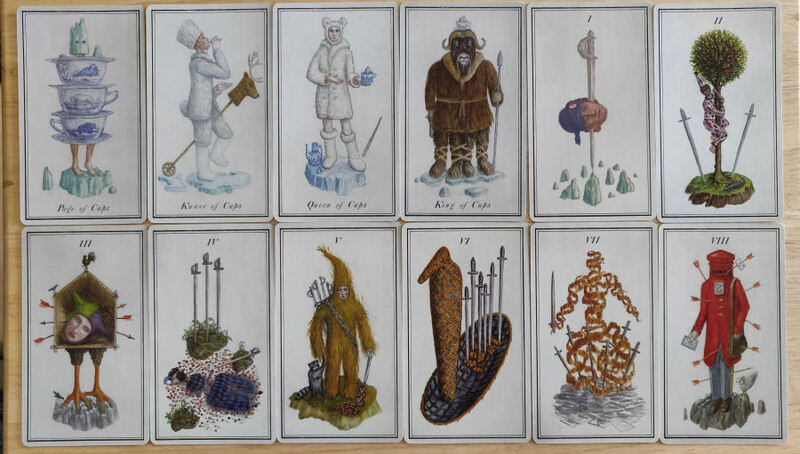 The premise of the deck is based on the cast of characters from Truppe Fledermaus, a photographic fable and art collection by the deck creators, which preceded the tarot deck. Heck, you can read a review of the art exhibition in the New York Times, here. The Majors aren’t numbered, but you do get recognizable titles, i.e., The Fool, The Magician, High Priestess, The Empress, etc. 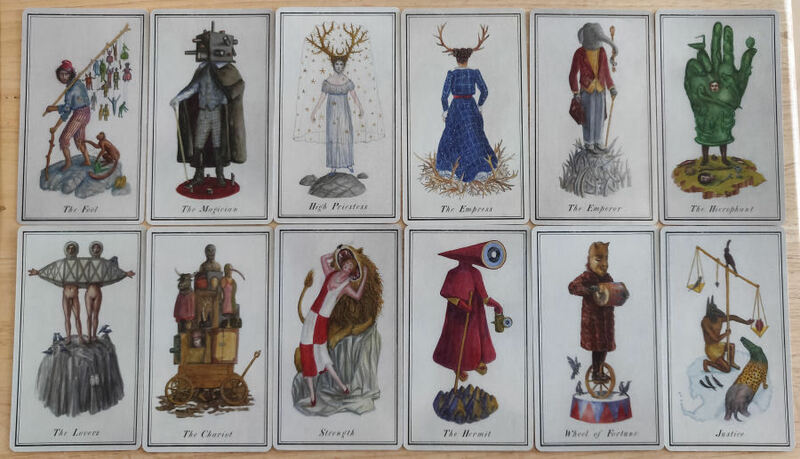 The correspondences that the artists chose to work with for assigning characters from their work to the tarot keys is what I’d consider unconventional. For example, the elephant for The Emperor, actually based on some of Crowley’s writings I might have corresponded with The Hierophant, though I certainly see why they went with the hand forming the sign of the cross for their Key 5. The High Priestess with the antlers and veil of stars can trip up a more conventional tradition-based tarot reader if it weren’t for the card title. In terms of comparing my interpretative approach to the cards and the creators’, when I first saw The Moon card, before I read the title, I actually thought it was the High Priestess. Other than the few cards here and there, by and large the imagery stays true to iconic and familiar tarot symbolism. See, for instance, The Hanged Man, Death, Temperance, The World. There is just no doubt in your mind that this deck was produced by professional artists. The color palette is consistent, chosen with a technical precision that you don’t even notice as a viewer because the images also capture so much emotion that you’re swept into the sentimentality. Rather than being situation-based in depiction, the way that, say, the illustrated pips of the Rider-Waite-Smith are, or concept-based like the Thoth, Carnival is character-based. It’s about portraying an other-worldly fantastical character that’s not only an individual but also a member of a community, and a whole community has been produced here. The artwork itself consists of watercolor and gouache paintings and the tarot deck was intended to showcase the fine art collection. An underlying theme and message of the art is an expression of what climate change is doing to the remote islands of our world. 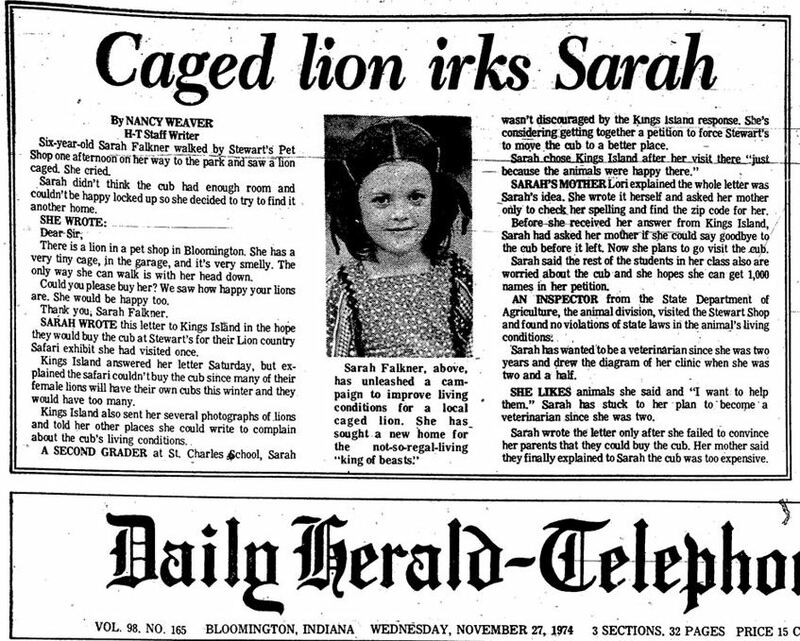 The story here is about the visible impact of a chemical-induced change to our atmosphere on the individual members of our society and, in particular, those members who are marginalized. This tarot deck tells the story of society’s throwaways, and how society’s throwaways come together to form their own close-knit, supportive, tribal community. 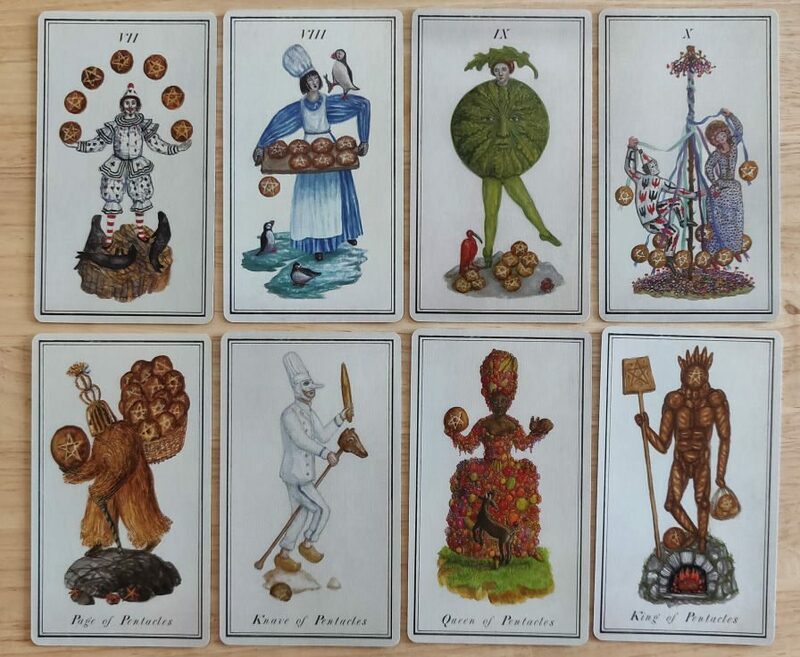 While Carnival is marketed by its creators as a contemporary tarot deck, I see a distinct old world charm to it. There’s a theatrical drama to the characters depicted on each card that I think Pamela Colman Smith, who herself had a personal interest and background in theatre, would have greatly appreciated. On that note, while there are strong Rider-Waite-Smith structural influences (i.e., Key 8 in Carnival is Strength and Key 11 is Justice), it’s also a wholly unique deck. That’s why I love reading the deck in tandem with its guidebook, and integrating the guidebook as part of the divinatory process. 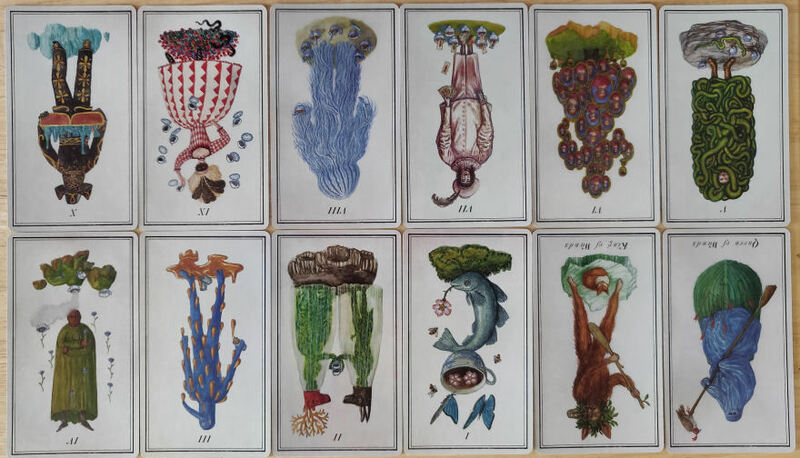 Thus, I don’t just read the tarot card, but also work with it as a form of bibliomancy, folding in the corresponding card entry in the guidebook as part of the interpreted reading. But more on the guidebook later. I would consider this a non-traditional tarot deck in terms of the symbolic imagery. It’s not a dupe of any established system, so without the hint of the card titles, for about half of these cards, I wouldn’t necessarily be able to identify what card it just from the imagery. But that also means about half pay close homage to classic tarot symbolism–the Six of Swords, for instance, or Two of Cups. By the way I love that Queen of Pentacles! That’s art I want as a print or poster hung up and framed on my wall! Now let’s talk about the guidebook, which is a magical read. It’s written by Sarah Falkner, a medium channeling Madame Lulu. So the book, in that sense, is written by Madame Lulu. In some of my background reading for writing this review, I came across Falkner’s Bio page, which featured the above newspaper clipping. Now that’s the Strength card in real life! And just makes me fall in love with the author of the guidebook all the more. The guidebook is a fantastic read. It’s what makes the tarot deck come alive. Without it, Carnival is just a unique art deck for your tarot collection. With this guidebook, it actually becomes a divination tool. I love doing a one-card draw with Carnival, and then looking up that card meaning in this book. The guidebook relays a story and gives the card meaning in story form. Reading the guidebook was, for me, part of the divinatory experience. 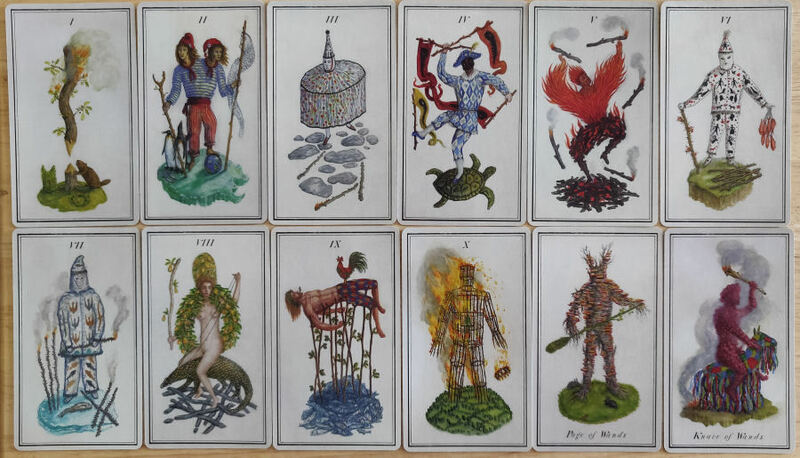 I integrate cartomancy (reading with Carnival, the deck) and bibliomancy (cross-referencing the card with the narrative passages in Madame Lulu), which transforms Carnival into a rather extraordinary reading experience. I adore the book. It’s exquisitely written with an ambiance of mystique– the weaving of powerful old world magic. Madame Lulu’s Book of Fate adds to the prophetic tone of tarot readings with Carnival. The style of writing in the guidebook reminds me of a fortune-teller in a dimly-lit tent, with bad teeth, smelling of patchouli, and reptiles preserved in glass jars lined on the shelves behind her. Overall, the deck’s greatest strength is its world-building or, as I noted earlier, community-building. 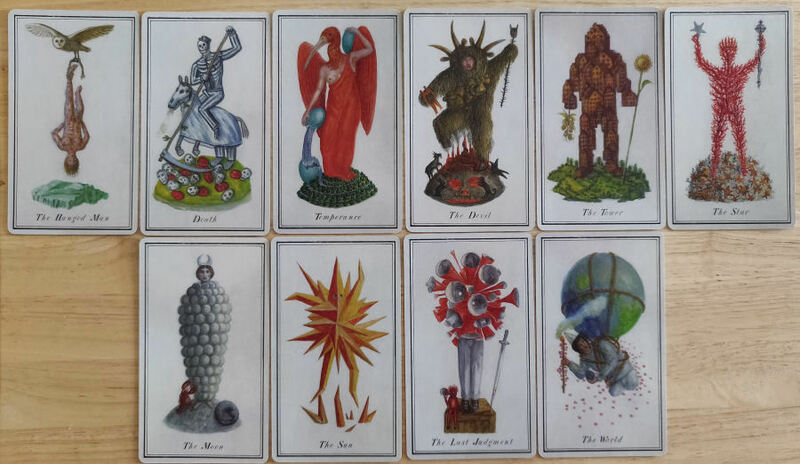 The Carnival at the End of the World Tarot is one of those high-concept art decks that the tarot aficionado definitely wants in a tarot deck collection. There’s a keepsake charm to the production quality and the way the deck creators married their art exhibition with the structure of a tarot deck is brilliant. The creativity level here is top-shelf, resulting in a superb art deck that is both evocative of real-world issues we’re facing and of the supernatural. Beautifully executed. FTC Disclosure: In accordance with Title 16 of the U.S. Code of Federal Regulations Part 255, “Guides Concerning Use of Endorsements and Testimonials in Advertising,” I received Carnival at the End of the World Tarot and its companion guidebook, Madame Lulu’s Book of Fate, from the deck creators for prospective review. Everything I’ve said here is sincere and accurately reflects my opinion of the deck and book. Physical Proofs Are In! Now Awaiting Full Shipment. I didn’t know that deck existed! and now I’m all excited about it. 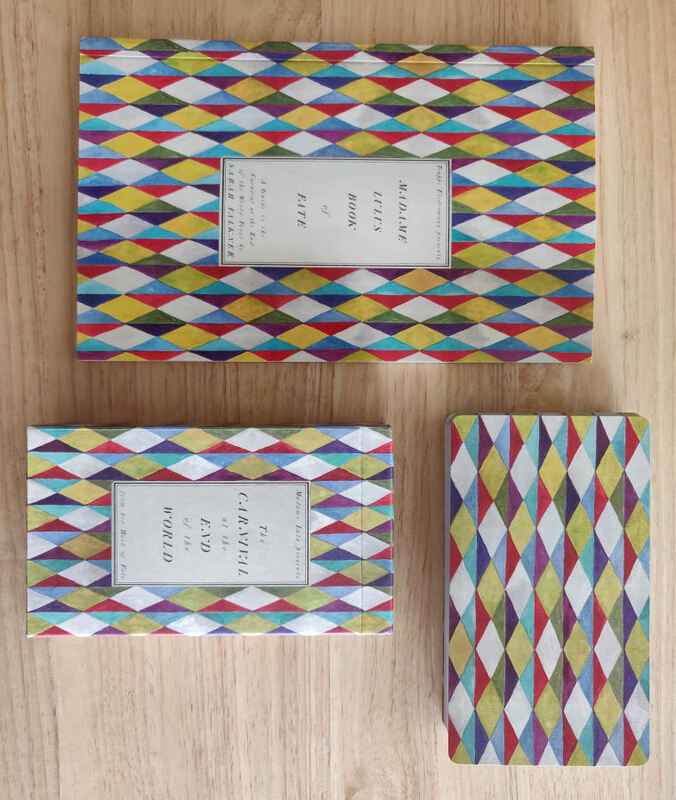 These are the artists who made the wonderful Eisbergfreistadt playing cards that I adore! It’s a dream come true for me that they made a tarot deck, too. Wonderful review, thank you!